I am the one in the costume the costume. I've been told on numerous occasions that I look like the actress who played Gamora. After seeing the movie (Guardians of the Galaxy) I knew I could pull her character off. I bought each piece individually from Amazon the shirt, the tights, the pleather shorts that went over the tights and the belts. 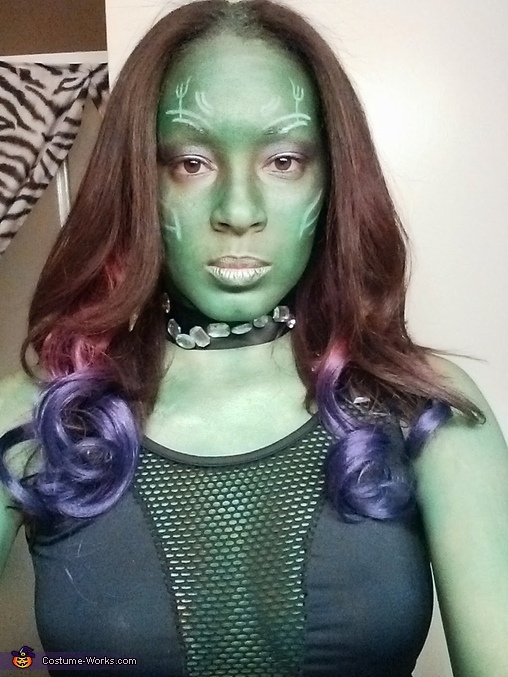 I found Green body paint and my gloves at a party store, then I had purchased some shiny light and dark green eyeshadow that I put over the green body paint to blend in better. I used purple eyeshadow and purple eyeliner on my eyes and a green shadow pencil that was waterproof for around my eyes and on my lips. It stayed on my lips all night even after I ate did not come off until I used makeup remover. However, it was fairly easy for all of the body paint to come off in the shower, minus the green armpits that I had left over even though I try to avoid painting my armpits. two showers and all the green is gone. honestly I think the eye shadow used all over the body paint help keep the body paint on, as it didn't seem to rub off on anybody I was dancing with or hugged. The markings on my face were done with a white eyeliner pincel. The hair extensions I ordered was not the hair I received but still worked for the look. Altogethers I may have spent roughly around $65 to $80 dollars; however, each piece I bought I can wear again later. so it wasn't a waste of money as if I would have a one peice costume online and only been able to wear it for costume occasions. For the part around my neck with the jewels, I bought ribbon and stick on jewels (for fabric), I wrapped around my neck and safety pinned the ends to the shirt so that I would not move. none of the jewels fell off and everything stayed in place. The pictures I AM uploading are actually pictures from after going outand dancing all night. So as you can see everything held up pretty good.